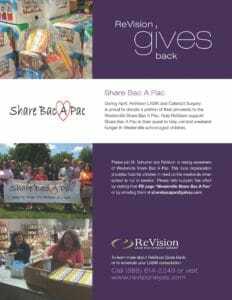 During April, ReVision LASIK and Cataract Surgery is proud to donate a portion of their proceeds to the Westerville Share Bac A Pac. Please join Dr. Schumer and ReVision in raising awareness of Westerville Share Bac A Pac. This local organization provides food for children in need on weekends when school is not in session. Visit their FB page “Westerville Share Bac A Pac” or email sharebacapac@yahoo.org to learn more.